Trade-ins are being accepted, if that really even matters. Missed out on your chance to buy a new LaFerrari direct from Ferrari? Yeah, well, get in line. 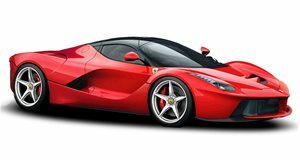 Unless you were a preferred and loyal Ferrari customer, the chances of you simply being given the opportunity to buy a new LaFerrari was pretty much nonexistent. Fortunately, there’s the second-hand market, and it was only a matter of time until a few LaFerraris arrived there. But just because they’re used doesn’t turn them into bargains. No, you’re going to pay more. A lot more. This 2014 LaFerrari is currently up for sale at Naples Motorsports in Naples, Florida, who also claims it’s the only LaFerrari for sale right now in North America. The price? $5,000,000. Original price: just over $1.4 million. This one has a black exterior and tan interior and just 202 miles on the clock. For the record, the dealer has financing options available and accepts trade-ins.